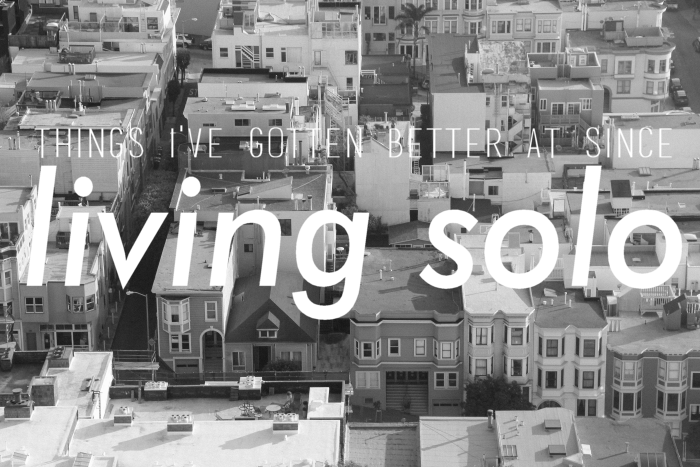 The transition from living with roommates to living alone can be a scary and exciting one. I know that I cycled between a bevy of emotions when I decided to live alone for the my senior year of college. The prospect of living solo had it's theoretical perks like "I can decorate every inch exactly how I want!" and "I don't have to be mindful of anyone else's schedule!" and "I can invite people over whenever I want to without having to ask!" On the flip side, living alone also had it's potential downsides like not having someone to split the cost of bills or food and not having a constant person there to hang out with. Both sides have come to fruition in some way or another. Freshman year I lived with a roommate and two suite-mates in a dorm that was probably too nice for my unappreciative freshman self. Sophomore year I transitioned into living in a new two bedroom apartment in a brand new apartment complex (that was also way too nice for me, retrospectively) with my freshman roommate in tow. Junior year, I took a big leap and moved into a sorority house filled with 90+ girls, four of which I considered, at the time, to be my best friends. Fall semester I lived in a three girl room, with two of said friends and Spring semester I lived in a two girl room with a girl a year older than me (who was actually a pretty great roommate and owned a TV). Now, this. I'm living alone in a cute apartment with a decent rent, plenty of space, and huge closet (but no TV). Despite my mid-summer apartment struggles, I'm here and I'm doing this. Holding Myself Accountable: Since there's no roommate there to remind me to do things or "hey, we're out of milk!" (and definitely no mom and dad), it's really up to me to keep myself accountable for things. There's no one to take turns taking out the trash with and there's no mutual grocery list going on. It's up to me to keep up with the bills and when all the things are due. This whole experience has made me a much better planner and list-maker, which I definitely didn't think was possible. Not Being So Scared: The first three or four nights after moving in were semi-terrifying. Me in this unfamiliar moderately sized apartment all alone with all of these unfamiliar sounds? #nope. Everything set me on edge and I triple checked to make sure my doors were locked and slept with my room door open and the hallway light on. Yes, I'm a scaredy cat. In hopes of not running up the electric bill, I eventually moved my bed to a more 'safe feeling' location, decided to get into a bed time routine that involves checking to make sure everything is locked and unplugged, invested in desk lamp and closed my door at night. Though there are sometimes I still get a little spooked (mostly because I can hear my neighbor lock and unlock their door really loudly...so much so that it sounds like someone's trying to break in at times and sometimes the air kicks on a little too suddenly), I've gotten a lot better about not being so scared when I'm alone. It's a mental thing and it's all about baby steps. Making Plans With Other People: Living alone has actually caused me to be more social. Since I don't have a live in person to go do fun stuff with at any hour, I have to be more intentional and proactive about my time spent with others. I make sure to plan to eat at my sorority house a couple times a week, plan wine and movie nights, nights on the town and dinners with others. I feel like my social life has never been more fulfilling or more in order. Cooking at Home More Often: One of my favorite parts about living in my apartment (one thing I missed dearly when living in the sorority house) is my kitchen. I love my kitchen and I love that I have unlimited 24/7 access to that bad boy. I've been cooking and baking more than ever. I don't eat out nearly as much as I have in the past and it makes my eating out more intentional. I love having the option to cook at home and am taking advantage of it frequently. So far I've made lots of pancakes, stirfrys, cookies, my first homemade apple pie, a new spaghetti recipe, and lots of other things! Planning for School / Other Things: Getting to school is slightly more of a challenge these days. I live off campus, not terribly far by any means, but not terribly close either. It takes a lot of time and effort to plan out getting to school in the mornings. I have a class that starts at 10:45, but I usually have to leave my apartment in the 10:00-10:10 window. I get in my car, drive to school (account for traffic), get to a green lot (aka a general parking pass lot which is usually filled to the brim by the time I'm there because of all the people who got to school earlier for 8:30 and 9:30 classes), park in the back, walk a few minutes to where the bus picks up and wait for a bus that's on rotation every ten minutes (and that's if it's on time). I take the bus up to campus and then walk to where my class is from there (roughly 4-5 minute walk). So, nothing is simple about getting places. Same goes, if I want to leave campus or come back for chapter. I could park in a garage right on campus and pay the meter, but at $1.55 an hour, those rates aren't too friendly. This also goes for nights out on the town. After a few times of being late, I feel like I've finally gotten into a good groove. I miss living on campus simply because it took me no time to get anywhere I needed to be. Class was 15 minutes or less away and a night out consisted of only walking a street over. Those were the days!